“You can’t yell ‘fire’ in a crowded theater” is one of the most commonly used First Amendment catchphrases — but does it really support exceptions to free speech? The answer to this question can be found in the writings of Supreme Court Justice Oliver Wendell Holmes. He penned the phrase in 1919, not to justify moderate limits on speech, but to justify government prosecution of those speaking out against the draft. In this episode of Make No Law, the First Amendment Podcast by Popehat.com, host Ken White explores the origins of the phrase “You can’t yell ‘fire’ in a crowded theater” and whether or not it actually calls for exceptions to the First Amendment. Featured guests include history professor Michael Kazin, who shares his knowledge of the WWI effort and the resulting tension, and author Nat Brandt, who expands on what made fire in a theater such a powerful analogy. Ken also discusses the Espionage Act of 1917 and the role of Oliver Wendell Holmes in the history of free speech. Male Speaker: You can’t cry fire in a crowded theater. Male Speaker: But you can’t shout fire in a crowded theater. Female Speaker: You are not allowed to go into an auditorium and yell, fire, fire, fire. Male Speaker: I mean, think about it, we all believe in the First Amendment, the guarantee of free speech, but we accept that “You can’t yell ‘fire’ in a crowded theater”. Ken White: “You can’t yell ‘fire’ in a crowded theater”, it’s the most popular and widely known catchphrase about free speech. It’s America’s go-to way to say that free speech is not absolute and that the First Amendment has exceptions, although there are variations. Female Speaker: Because the Constitution does not say that a person can yell ‘wolf’ in a crowded theater. Ken White: You hear it on TV and read it in newspapers. It’s invoked by college students and professors, politicians and radicals, lawyers and clergy and everyone in between, but does it mean anything and where does it come from? To answer that, we have got to go back a 100 years to the source. The legendary Supreme Court Justice Oliver Wendell Holmes, Jr., who was writing in 1919 and we have got to look at what he actually said rather than the way we misquote it. Ken White: That was an analogy. The First Amendment case before Holmes wasn’t about a fire. It wasn’t about physical danger of any kind. Oliver Wendell Holmes used that analogy to justify the government jailing someone for speaking out against the draft. I am Ken White, and this is Make No Law: The First Amendment Podcast from Popehat.com, brought to you on the Legal Talk Network. This is Episode, 7 Fire in a Crowded Theater. Ken White: The shout of fire Oliver Wendell Holmes was talking about was opposition to the military draft and his theater was America’s entry into World War I. The Great War, a war to end all wars, began in August 1914, but America didn’t get into it until April 1917. It was an unpopular war with many Americans. I talk to Professor Michael Kazin at the History Department of Georgetown University. He wrote a book called ‘War Against War: The American Fight for Peace, 1914-1918’. I asked him about the unpopularity of the war in America. Michael Kazin: There were anarchists, as I mentioned, like Emma Goldman; there were also what you might call the left-wing populist, Robert La Follette, the eloquent Senator from Wisconsin had voted against the war in 1917. He continued in some ways to speak out against the war and got in trouble, was almost expelled from the Senate for speaking out against the war. I think there was a general sense among a lot of people in the country, though probably not a majority, especially poor people, African-Americans, as well as Whites that this was what one anti-war activist called a rich man’s war and a poor man’s fight. And it was clear that richer Americans, especially from British backgrounds tended to support the war, whereas Americans from Irish backgrounds, of course German backgrounds, Jewish backgrounds, and a lot amongst others too tend to be leery of it, believing that this was not a war that was going to help them have a better life. Ken White: One particular part of the war that was especially unpopular was the draft, passed in 1917. Michael Kazin: The idea of the draft was unpopular in America, a country which after all was — which our sort of national religion in some ways, secular religion was self-reliance, individualism, the idea that the government shouldn’t be able to force you to do something you don’t want to do. And of course, the idea that government can force you to, if you are a young man, to go into the military and risk your life was something that — there was even some people who supported the war were not crazy about that. So with mainstream Democrats in the, what was then the President’s Party, the Democrats, saying that kind of thing, you can imagine there was a lot of unhappiness. And there were a lot of Americans who resisted the draft just by not cooperating with the government, which was a lot easier to do 100 years ago when a lot of people didn’t have government documents with them, and they weren’t really known to the government in the way pretty much everyone is known to the government now. Ken White: But America could not fight without conscription. It just didn’t have the army. Michael Kazin: You know, there was a real fear, I think, that President Woodrow Wilson had, Congress had, the Justice Department had that if you allowed Americans to speak out freely against the conscription law that it would encourage Americans to disobey it, and that would make it very difficult to raise the kind of army, large army that those who supported the war thought was necessary. The US military increased tremendously during the war. People don’t really, I think, appreciate that there were fewer than 200,000 men in the army before the war was declared in 1917, and by the end of the war, there were 4 million men in the army. So that’s an increase in military force that US has never seen before really and that necessitated have a draft approach. Ken White: Add to that another fear, the fear of the other, the immigrant, the ethnically tinged anxiety about a nation that now includes people from the very countries that we would be fighting. Michael Kazin: Also, I think a sense that in a country which is full of immigrants, many of whom were not well assimilated, didn’t speak English, didn’t want to be assimilated necessarily, often had loyalty to their home countries which were fighting against one another in this Great War overseas, that there was a sense that if you didn’t force people to go along with the war effort and go along with the conscription law that the country might fall apart. The melting pot in fact was not melting. There were a lot of so-called hyphenated Americans as Woodrow Wilson called them who refused to give up their hyphens, their foreign ethnicity. So that was probably what was going on as well I think. Now, of course, today we have a lot of resentment by some people against immigrants, but a lot of other immigrants of course speak English and are part of American life. But then I think there was more of a sense that America was fragmented between people from different nationalities and different racial groups and I think the fear was that if there wasn’t coercion, then the fragmentation would continue and America might actually be unable to fight the war effectively. Ken White: There’s nothing more dangerous to freedom than a fearful Congress, and this was no exception. In June 1917, just two months after declaring war, Congress passed the Espionage Act of 1917. The Espionage Act prohibited, among other things, speech, willfully causing or attempting to cause insubordination, disloyalty, mutiny, refusal of duty in the armed forces, or willfully obstructing the recruiting or enlistment service of the United States. President Woodrow Wilson had been agitating for a law like this for years, even back when he was nominally trying to keep us out of war. Here is what he said about it in his State of the Union Address in 1915. President Woodrow Wilson: “I am sorry to say that the gravest threats against our national peace and safety have been uttered within our own borders. There are citizens of the United States, I blush to admit, born under other flags but welcomed under our generous naturalization laws to the full freedom and opportunity of America, who have poured the poison of disloyalty into the very arteries of our national life; who have sought to bring the authority and good name of our Government into contempt, to destroy our industries wherever they thought it effective for their vindictive purposes to strike at them, and to debase our politics to the uses of foreign intrigue. Ken White: Do you want an Espionage Act, because that’s how you get an Espionage Act. This will not be the last time you hear about the loathsome and un-American Espionage Act on this podcast. The 20th Century saw it used time and time again against dissenters. Its use in World War I was especially vigorous and to our modern years, especially outrageous. In May 1918, an activist named Rose Pastor Stokes was sentenced to 10 years in federal prison by a judge in Missouri. She was sentenced for a letter to the editor that said I am for the people while the government is for the profiteers. The judge said our armies on the field can succeed only so far as they are supported by the folks at home. In Kentucky, a man was prosecuted for a pamphlet that argued that military service should be voluntary, made up of people who wanted to fight and that people who did not agree with the war, should not have to fight. Into this soup of fear and censorship walked Charles Schenck. Schenck was a socialist, the General Secretary of the U.S. Socialist Party in Philadelphia. The socialists were strongly against the war. He and his compatriots drafted a leaflet, a double-sided piece of paper covered in small print, railing against the war. They sent it to 15,000 men who had been drafted to fight. The leaflet combined a rousing celebration of constitutional rights, with both socialist and anti-war rhetoric. It was headed in big bold type, Long live the Constitution of the United States. Wake up, America. Your Liberties are in Danger. A lot of the leaflet sounds like something out of a patriotic rally. Charles Schenck: The Constitution of the United States is one of the greatest bulwarks of political liberty. It was born after a long, stubborn battle between king-rule and democracy. In this battle, the people of the United States established the principle that the freedom of the individual and personal liberty are the most sacred things in life. Without them, we become slaves. For this principle, the fathers fought and died. The establishment of this principle they sealed with their own blood. Ken White: The rest of the leaflet was strongly anti-war, with a socialist sensibility. It compared being a conscript to being a slave or a convict forced to kill or die against your will. It suggested that the war was the will of the elite of Wall Street, not the will of the people, and it told conscripts to assert their rights. It didn’t tell them to riot or overthrow the government or engage in violence, it told them in a rather nonspecific way that they should not submit to intimidation and they should exercise their right to assert their opposition to the draft and that they should resist the government’s message that the war was just. Charles Schenck: Will you stand idly by and see the Moloch of Militarism reach forth across the sea and fasten its tentacles upon this continent? Are you willing to submit to the degradation of having the Constitution of the United States treated as a “mere scrap of paper”? Do you know that patriotism means a love for your country, and not a hate for others? Will you be led astray by a propaganda of jingoism masquerading under the guise of patriotism? Ken White: Schenck was arrested, charged, and convicted under the Espionage Act and for misusing the United States mails. And how is this for swift justice, the law was passed in June, Schenck was indicted in September and he was convicted in December, all of 1917. Charles Schenck unsuccessfully argued that his speech was protected by the First Amendment and he took that argument all the way to the Supreme Court. His argument was the obvious one, how can we be a free society if we can’t debate whether a war is just or unjust? Here is what his lawyers wrote in a Supreme Court brief. Male Speaker: If all opponents of a war are suppressed and all advocates of a war are given free rein, is it not conceivable that a peace–loving president might be prevented from making an early, honorable peace, founded on justice. How can the citizens find out whether a war is just or unjust unless there is free and full discussion. If it is criminal to say the Draft Law is wrong, then it is criminal to say that any law is wrong, for the Constitution, we are told, is not suspended in time of war; but we dare not attack it or our form of government. Ken White: The government’s brief was quite dismissive, calling Schenck’s appeal to the First Amendment frivolous and insubstantial. The Supreme Court in an opinion written by Justice Holmes made short work of Charles Schenck’s argument. This was the dawn of First Amendment analysis. Even though the amendment was 130 years old, there were almost no cases exploring how it worked or what it meant or what exceptions to it there might be. Lawyers say that bad facts make bad law. These facts, an apocalyptic war in a troubled nation, were very bad. Justice Holmes said that the gravity of the situation, the war justified the restriction on speech. Justice Oliver Wendell Holmes, Jr.: The question in every case is whether the words used are used in such circumstances and are of such a nature as to create a clear and present danger that they will bring about the substantive evils that Congress has a right to prevent. It is a question of proximity and degree. When a nation is at war, many things that might be said in time of peace are such a hindrance to its effort that their utterance will not be endured so long as men fight, and that no Court could regard them as protected by any constitutional right. Ken White: That phrase, clear and present danger, slowly became not just a catchphrase, but a test of when the government could punish speech despite the First Amendment. It would be the test for 50 years. You might notice how circular it is. Speech can be punished if there is a clear and present danger that it will bring about the evil that Congress has a right to prevent. Okay, but what does Congress have the right to prevent? Does Congress have a right to prevent an opinion, a state of mind, a wave of opposition to what Congress wants? Does Congress have the right to prevent me from persuading you of something Congress doesn’t like? It’s ambiguous really. Not much of a restriction on government power at all. In support of its conclusion, Holmes also uttered the immortal phrase about fire in a theater. Justice Oliver Wendell Holmes, Jr.: We admit that, in many places and in ordinary times, the defendants, in saying all that was said in the circular, would have been well within their constitutional rights. But the character of every act depends upon the circumstances in which it is done. The most stringent protection of free speech would not protect a man in falsely shouting fire in a theatre and causing a panic. Ken White: Holmes was a famously gifted writer, renowned for his ability to evoke an emotional response with his writing. This analogy to a fire in a theater was well calculated to get just such an emotional response. It doesn’t hit us in the gut here in 2018, but in 1919, invoking a fire in a theater causing a panic was a powerful rhetorical device. The 19th and early 20th Century was a time of deadly theater fires. Construction was shoddy. Theaters were firetraps and people still used candles and lanterns. The result could be catastrophic. On December 30, 1903, the Iroquois Theater in Chicago burned. It had been promoted as a modern safe theater, but it wasn’t. During a weekday matinee of a musical, a spark from a light caught a stage curtain. Actors on the stage tried to calm the crowd, which was largely women and children, but they failed. The crowd panicked, and at the end of it, more than 600 men, women, and children had died, died from the flames, died from smoke, died from being trampled or pressed to death in a desperate rush to get out. Nat Brandt wrote a book about the Iroquois fire called, fairly enough, ‘Chicago Death Trap’. I talk to him about how common these fires were and how they played on the minds of the public in this time period. Nat Brandt: Take the Iroquois Theater, for example, an absolutely new theater. It opened up in November of that year and this was December now. They had sliding gates going up to the balcony and the gates were — in order to get to the balcony, you would pass up the last flight of stairs and then the gates were pulled across and locked, so that people couldn’t drift down and try and get better seats in the orchestra. They were kept locked. I mean you would never do that today or you shouldn’t. There were no exit signs; they hadn’t been put up yet. They were still being worked on. There were so many things that were omitted. There were fire hoses, but no water for the hoses; that hadn’t been attached yet. I mean you name it and it went wrong. Ken White: The fear, the visceral horror of these fires helped drive the casualties, because people reacted to the fires with sheer deadly panic. Nat Brandt: Well, the ushers, all of whom were teenagers, there was no fire drill for the ushers; what they should do, where they should lead people, and there were certainly no signs pointing as to where the exits were. So yeah, it was just madness. Ken White: So today, in 2018, when we read the analogy, this speech is like shouting fire in a theater and causing a panic, we mostly think of how trite the phrase is. But when Holmes used it, he was invoking some of America’s most primal fears at the time. I think to get the same emotional response now you might have to use the analogy, this speech is like shouting he has got a gun at a school. To us, it’s ridiculous that such mild anti-war rhetoric as Schenck’s, couched in references to the Constitution, heavily supported with explicitly patriotic appeals, could be seen as comparable to a terrible fire. But 1919 was different than 2018. The government’s fear that it wasn’t certain it can script everyone it needed was real, and even though the war ended in November 1918, there was another fear lurking, the fear of revolution. Here is Professor Kazin again. Michael Kazin: When there were revolutions happening, when the Schenck case was decided, actually in 1919, after the war had ended, a few months afterwards, there were revolutions in Germany, attempted ones in Italy, in China; 1919 was a year sort of like 1968, which is what people are talking about a lot these days, where revolutionary movements and revolutions seemed to be popping up everywhere. So there was a real fear that that would happen in the United States as well. In Seattle, there was a general strike which shutdown the city and some people talked about the Seattle Soviet, where workers would run the city and maybe go on to run the state and maybe even try to run the government itself. So this was a tumultuous time and the government crackdowns were I think popular among most Americans, because they were afraid that America would be changed to a beyond recognition. Ken White: Fear drives censorship. So what did it mean that you can’t falsely shout fire in a theater and cause a panic? Ultimately, it was just a florid way to say that the First Amendment is not absolute. It’s a way to say the First Amendment shouldn’t be absolute, that we can imagine speech that we can agree would be outside of it. It’s a classic argument to test the viability of a right by applying it to the most horrible conduct we can imagine. In other words, it’s pure rhetoric, not substance. But what does it mean today, in 2018? What does it mean when people repeat it to support some restriction on free speech or on other rights? What legal weight does it have? It really means absolutely nothing. It’s a rhetorical device to say the First Amendment is not absolute, which is true, but that’s not in dispute. So unless you say it in response to someone who says the government can’t punish any speech whatsoever, it does not advance the argument you are making. It doesn’t say a single thing of substance about whether the speech you are talking about is protected by the First Amendment. It’s as if we were looking at an animal on the side of the road trying to decide what it is and I said not all animals are cats. Your reaction would be yes, thank you, I am aware, but the question is, what is that animal? We have the tools we need to decide what that animal is on the side of the road. With free speech those tools are a 100 years of Supreme Court cases. Back in Episode 5, I talked about the case, United States v. Stevens, the Crush Videos case. I am still hearing from some of you about the sound effects on that one. That was such a sordid little case, but so important. It was important because the Supreme Court used it to explain how we go about answering this question. Now that we have agreed that not all speech is protected, is this particular speech we are talking about protected? The answer is that first we start with a presumption that a law punishing speech for its content or message or subject matter violates the First Amendment. We look to see if the speech falls into a short list of well-defined historical exceptions to the First Amendment; obscenity, defamation, fraud, speech that’s integral to criminal conduct. And if the speech doesn’t fall into one of those narrow categories, the government cannot restrict it, unless it can pass that incredibly tough test called strict scrutiny, which is almost always fatal. So how much does saying you can’t shout fire in a theater help you in doing that analysis? Not a bit. It’s empty words. Every time someone says it I get a little more misanthropic. That’s the end of the free speech story of Charles Schenck, but it’s not the end of the free speech journey of Oliver Wendell Holmes. How did the man who crafted history’s most useless cliché about free speech become one of free speech’s heroes? You will have to wait for the next episode to find out. In this series of podcasts, I will be telling more stories behind important First Amendment decisions. If there is a case you want to hear about or a First Amendment question you would like answered on the podcast, drop me a line at [email protected]. Thanks for listening. You can find documents and cases mentioned on this podcast at popehat.com or legaltalknetwork.com. If you liked what you heard today, please remember to rate us in Apple Podcasts or follow us on Twitter or Facebook. Lastly, I would like to thank our participants, voice actors, producers and audio engineers for their participation. My guests Nat Brandt and Professor Michael Kazin; our voice actors, John Talifer as Justice Oliver Wendell Holmes, Bob Story as President Woodrow Wilson, Justin Jefferies as Charles Schenck and Mark Oblinger as Schenck’s lawyer, Producer Kate Nutting, Executive Producer Laurence Colletti, Research Assistant Jordan Miller, and last but not least, music, sound design, editing, and mixing by Adam Lockwood and assisted by Kelly Kramarik. See you next time for Episode 8, Fighting Face. Outro: The views expressed by the participants of this program are their own and do not represent the views of, nor are they endorsed by Popehat, Legal Talk Network, or their respective officers, directors, employees, agents, representatives, shareholders, or subsidiaries. None of the content should be considered legal advice. As always, consult a lawyer, please. 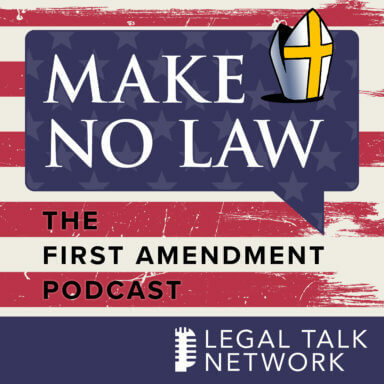 The Make No Law podcast explores the background of important First Amendment cases and the personalities and history that led to them.